Mrs. Loida Nicolas-Lewis takes no time in her preparation for Senatorial elections 2019. She has revealed her new team called the female empowerment team which will consist of Kris Aquino, Agot Isidro, Cynthia Patay and Korina Sanchez-Roxas. She revealed her latest statement that these women of power will definitely bring the Philippines to better heights. "I am afraid that the Senate has lost its balance in power. Only six senators namely Risa Hontevirus, Leila Dilemma, Franklin Drilon, Antonio Trollanes IV, Bum Aquino and Kiko Pangilinan are left fighting for democracy. But I believe that when we have Kris Aquino, Agot Isidro, Cynthia Patay and Korina Sanchez-Roxas in the Senate we are bound to balance the power. But first, we must move to get President Rodrigo R. Duterte to either resign or to get impeached. He must be locked up as he's about to undermine democracy. Kris Aquino will be the Joan of Arc of democracy for the Philippines. 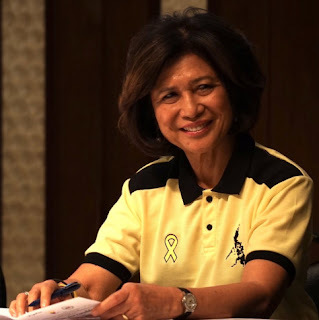 Her three years as Senator will be training to make her president in the place of her older brother Nobita Aquino." said Mrs. Lewis in an interview. Former APO Hiking Society Jim Parada composed a new song, "Mga Babae Ng Kalaayan" to promote Mrs. Lewis' women senatorial candidates as the female empowerment team. The song was met with a counter from his former bandmate Danny Javier who countered with a new song called "Mga Babaeng Laos". Javier also made a new song called "Shut Up Loida You Don't Own The Philippines" to counter Parada's antics. Javier mentions that he may or may not open a concert for a cause. He is still unclear as of the moment about his decision to write a new song called "Accept It Jim We're Old". "APO split up and I don't regret it. Parada still accuses the DDS Youth of trolling him but look who's talking. Why should Loida talk like she owns the Philippines. The Philippines belongs to Filipinos. I want no nonsense leadership. What I'm afraid of is that the Philippines loves voting for entertainers but show business and politics are two different arenas. What do Kris Aquino, Agot Isidro, Cynthia Patay and the frustrated first lady wannabe Korina know about politics anyway." said Javier in an interview.